In the spring of 2014 I applied to the Master’s of Fine Arts program at the University of Ottawa. I was accepted, which was wonderful, but my wife and I then adopted a baby boy, which was also wonderful, but the demands of the degree and the demands of a baby made for little sleep. To complicate matters, Miles had a persistent cough that rumbled through the night and which required a good deal of medical attention. At the time, one of my artistic pursuits was capturing atmospheric essence and sealing them permanently in custom blown-glass vessels. The elements of my dilemma – Miles’ cough, the enormous amount of coffee I consumed and my chronic lack of sleep – suggested a set of essences to be captured and the shape of the blown-glass containers. 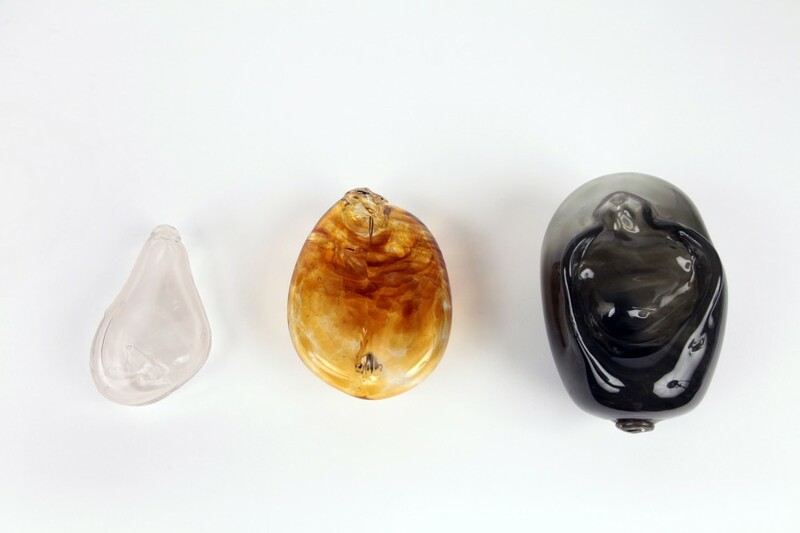 From left to right: Miles’ breath in a clear, to-scale, lung-shaped vessel; a sample of my coffee-breath in a bean-shaped pod; and a yawning face. The latter was created by me yawning while blowing the shape. The yawn caused a negative pressure which slumped the form and in this way the yawn itself was made permanent.